Joint Quantum Institute researchers have won two highly sought-after MURI awards from the U.S. Department of Defense out of 41 projects selected for funding in a nationwide competition. The Pentagon will provide a total of $260 million over five years to the FY2009 awardees in the Multidisciplinary University Research Initiative (MURI) program, with specific allocations to be determined in subsequent discussions. Paul Julienne of the National Institute of Standards and Technology, an adjunct professor at the University of Maryland (UMD), will head a collaboration titled "Ultracold Polar Molecules: New Phases of Matter for Quantum Information and Quantum Control." UMD is the lead institution, with members including Kansas State University, the University of Chicago, the University of Colorado and Georgetown University. Chris Monroe, professor of physics at UMD, is the principal investigator for "Quantum-Optical Circuits of Hybrid Quantum Memories," with UMD as the lead institution and team members at the University of Michigan, the University of California at San Diego, Duke University, the University of Illinois at Urbana-Champaign and the Naval Research Laboratory. MURI is a multi-agency program overseen by the Department of Defense (DoD) and comprising three awarding offices: the Army Research Office, the Office of Naval Research and the Air Force Office of Scientific Research. The awards are intended to provide long-term, sustained support for "research teams whose efforts intersect more than one traditional science and engineering discipline" and for "the education and training of students pursuing advanced degrees in science and engineering fields critical to the DoD, as well as for associated infrastructure such as research instrumentation." For the FY2009 competition, MURI solicited proposals for research on 32 different topics important to DoD, and 152 proposals were submitted. The proposals were merit-reviewed by panels of experts, and the winners were announced on May 8. Complete list of FY2009 MURI selected projects. 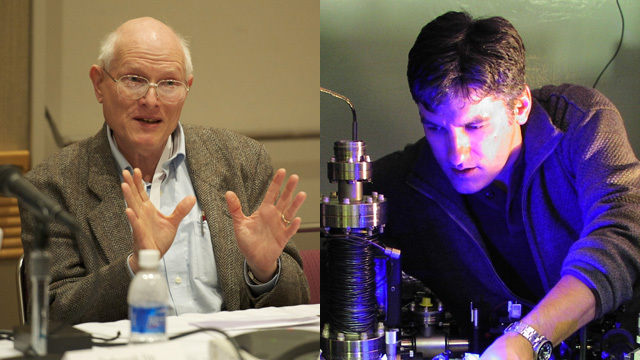 Two other members of UMD's Physics Department, Michael Fuhrer and Richard Greene, also received FY2009 awards.